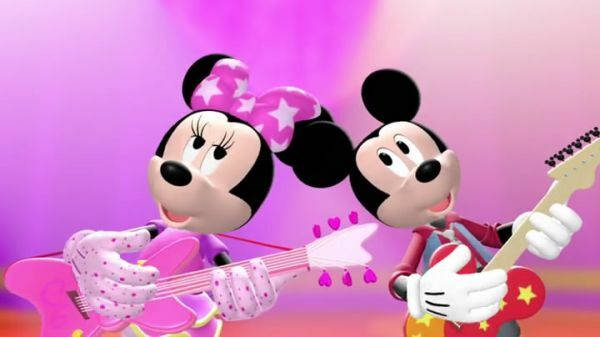 It's time to rock out with rockin' Mickey and pop star Minnie, singing their new song, I got a song that comes straight from my heart! MICKEY MOUSE: I got a song that comes straight from my heart! MINNIE: I got a song I hope you'll like from the start! MICKEY MOUSE: I got a rockin' song that I want to sing it for you BOTH: And you! We like makin' ya happy with a rockin' song! MINNIE: Hope it makes you want to dance and sing along! BOTH: Until you can sing all the words to our song! MICKEY MOUSE: Let's rock out all day long! MINNIE: Come on and sing our song! BOTH: It's guaranteed to fill you with joy! MINNIE: And, uh... MICKEY MOUSE: Um, hm... MINNIE: Now what? MICKEY MOUSE: Uh-oh. MINNIE: Oh, my! MICKEY MOUSE: We've got a big problem, Minnie. We never figured out how to end the song! MINNIE: You know, I think we'd better get a mouseketool to help us save our song. MICKEY MOUSE: Good idea, Min. Everybody say ALL: Oh, toodles! MINNIE: Oh! All that's left is the mystery mouseketool. 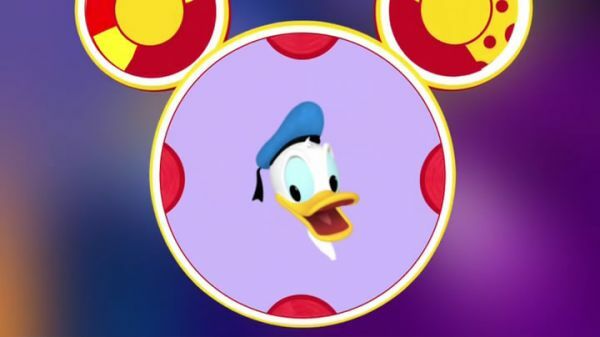 And you know what that means... MICKEY MOUSE: Everybody say: mystery mouseketool! ALL: Mystery mouseketool! MICKEY MOUSE: What's today's mystery mousekatool? ALL: Donald? PETE: How can old quackers help save your song? 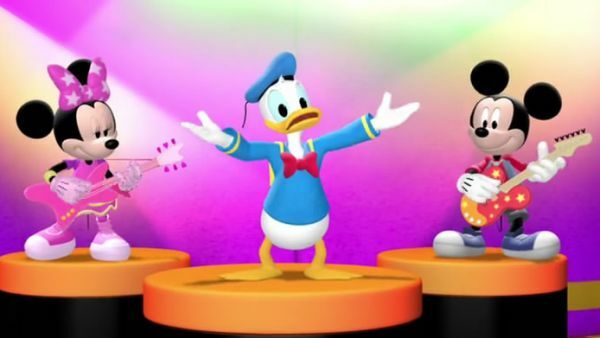 MICKEY MOUSE: Donald can sing the end. We picked all our Mouseketools. Say super musical cheers! MINNIE: Oh, Donald! Donald, we need you! MICKEY MOUSE: We want ya to sing with us! DONALD DUCK: You do? 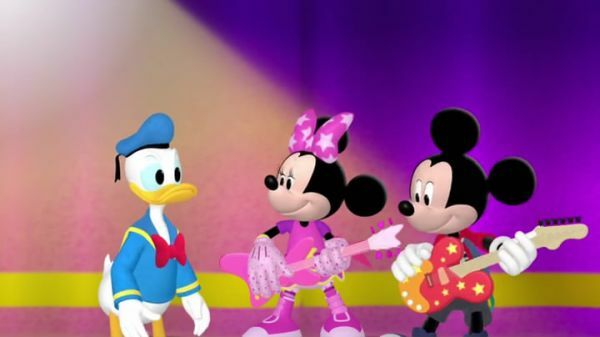 MINNIE: Oh, Donald, we always wanted you to be in our band. DONALD DUCK: You did? MICKEY MOUSE: Yep, and now you can save our song. DONALD DUCK: I can? MICKEY MOUSE: We know you can, Donald! DONALD DUCK: Oh boy, oh boy, oh boy! MINNIE: All you need to do is help us end our song. DONALD DUCK: Now, that I can do! Hit it! 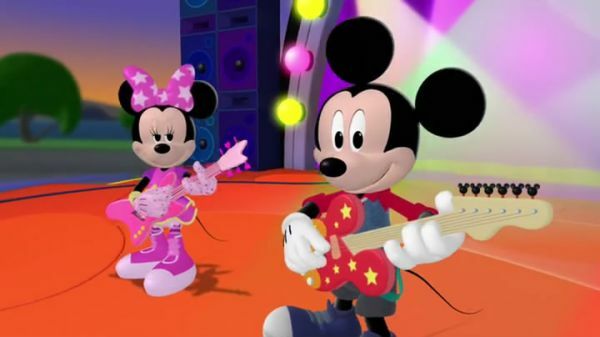 MICKEY MOUSE: We like making you happy with a rockin' song! MINNIE: Hope it makes you want to dance and sing along! BOTH: Until you can sing all the words to our song! 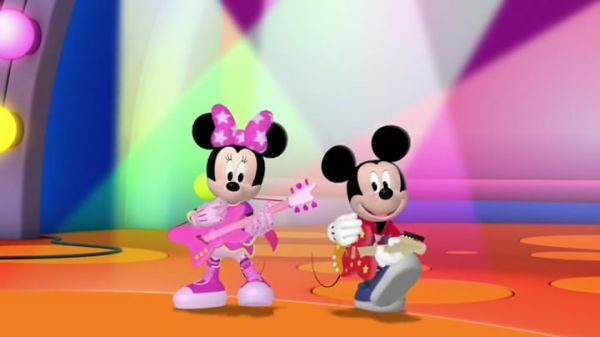 MICKEY MOUSE: Let's rock out all day long! MINNIE: Come on and sing our song! BOTH: It's guaranteed to fill you with joy! DONALD DUCK: Thanks to me. Oh boy, oh boy, oh boy! Thanks to me. Oh boy, oh boy, oh boy! DAISY: Hooray, Donald! Go! GOOFY: All right! PETE: You go, quackmeister! GOOFY: Great! CLARABELLE: Moo-arvelous! PROFESSOR VON DRAKE: Zowie-zoom-boom! Mr. Mickey, miss Minnie and Donald got a number ten! They're off the charts! And now, it's time to handing out the Clubhouse battle of the bands prizes. 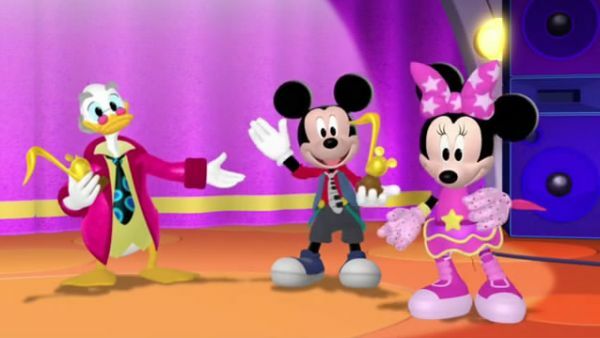 The award for the ones whose got the biggest clapping and the highest mouseke-clapper number goes to the rockin' Mickey and pop star Minnie band! MICKEY MOUSE: Ah gosh, thanks, everybody. GOOFY: Who gets the best-est of the best award? BOTH: Donald Duck! DONALD DUCK: Me?! Oh boy, oh boy, oh boy! Thanks Mickey and Minnie! You're the best test of the best, too. And you, too! MICKEY MOUSE: Thanks for helping out with today's Clubhouse battle of the bands. Now let's keep on rockin', Clubhousers. Stand up and do the hot dog dance!